The summer time card is a little ironic as yesterday we had bright sunshine then rain and later we even had hail stones here in the UK. Lacie with Ice-cream is a new digi image by Mo Manning and can be purchased from Digital Pencil Too, I used Stampin Up background papers, Nestabilities Ovals, a Prima Flower some dew drops ribbon and a bit of love to bring it all together. I added the Prima Flower then with a stickles glitter glue I just touched the edges of the flower to add a little sparkle. As a few people asked me to do a tutorial on how to use the nestabilities with an overhang of the image I have done one, it is over on the tutorial page. 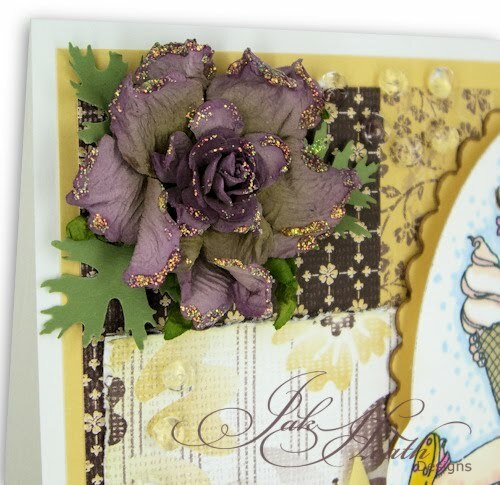 Oh, WOW, your card is truly gorgeous, but LOVE that glittered flower!!! Fabulous, Jak!!! Love your card Jak. These images from no are just too gorgeous. What a cute card Jak and thank you for the tutorial, very useful. Hey, you may have had all that weather 'up north' but here 'down south' it was overcast in morning but lovely and sunny in afternoon. No rain or hailstones for us so it wasn't all the UK that had your weather ... thank heaven! I've used the out-of-box method before from a tutorial I found somewhere on web (can't remember where now without looking but sure I linked to it on my blog at the time) and it does add something. Not done it quite like you've done though. Looks good. A WOW from me Jak and I just love what youve done to the flower. Such a beautiful card Jak...love the colours and the flower is gorgeous. What a beautiful card Jak, the prima flower is so rich, I love it! Am surprised to read of the hail, gosh, what a mix up of weather we have had this year. Beautiful card, Jak. Loving all the glitter on the flower. Yet another stunning card Jak, love the colours you have used and those Prima flowers are gorgeous, with or without the glitter. We had weather like that a few days ago up here in Scotland. This image is just adorable. You brought it to life with your artistic talent. Beautiful card!